In this workshop, girls ages 9-12 will learn fundamental and introductory skills in both entrepreneurship and web making in this hands-on, collaborative and creative workshop. Learners will be introduced to a variety of tools that will guide learners through ideation and conceptualization including basic HTML & CSS. Learners will learn how to work in groups as they ideate, gather findings, through to presenting their projects in demos at the end of the day! 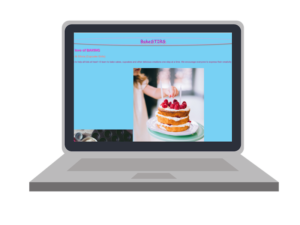 Using HTML & CSS - the coding languages of the web - sisters, Cassie & Olivia, built a website to promote their baking business. From idea to website during this workshop girls will bring their creativity to life, digitally! Register for Girls Learning Code Day in a participating city near you! Don't see your city listed? Want to host a workshop on #glcCodeDay? Join us for the big day by hosting your own glcCodeDay workshop! This is a beginner-friendly workshop. No coding experience needed for both you and your learners.